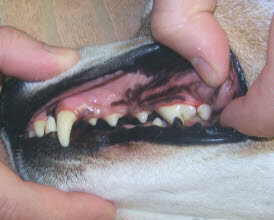 We offer cosmetic teeth scaling for your dog. We do this without sedation and only if the pet allows us - we only do this procedure on dogs we know and have formed a trust relationship. Most dogs do very well with us and are happy to have the tarter removed. We cannot go underneath the gum or remove teeth. 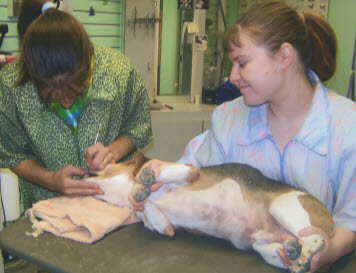 We will make you aware of any serious problems in which you may want to notify your vet. These are the teeth before. Keeping your pet's teeth clean is another part of a healthy pet. 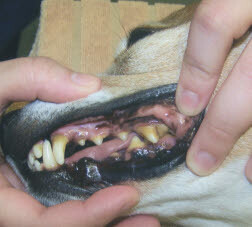 Tarter can cause the gums to receed which causes the teeth to decay and cause infection. Our Method of cleaning is cosmetic - we do not go under the gumline. We also do not use any type of anestesia. One person gently holds the dog and the other person scales the tarter off the teeth. These are the teeth after. As you can see, it makes for a brighter smile and much better breath.